To reach this place, the visitor has to penetrate through a maze of close, narrow, and muddy streets, thronged by the rougest and poorest of waterside people, and devoted to the traffic they may be supposed to occasion. The cheapest and least delicate provisions are heaped in the shops; the coarsest and commonest articles of wearing apparel dangle at the salesman’s door, and stream from the house-parapet and windows. 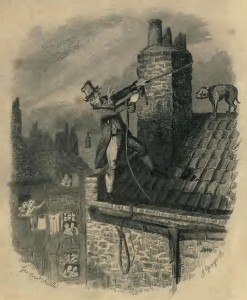 Jostling with unemployed labourers of the lowest class, ballast-heavers, coal-whippers, brazen women, ragged children, and the raff and refuse of the river, he makes his way with difficulty along, assailed by offensive sights and smells from the narrow alleys which branch off on the right and left, and deafened by the clash of ponderous waggons that bear great piles of merchandise from the stacks of warehouses that rise from every corner. Arriving, at length, in streets remoter and less-frequented than those through which he has passed, he walks beneath tottering house-fronts projecting over the pavement, dismantled walls that seem to totter as he passes, chimneys half crushed half hesitating to fall, windows guarded by rusty iron bars that time and dirt have almost eaten away, every imaginable sign of desolation and neglect.